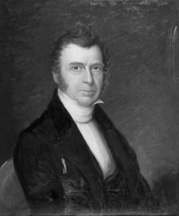 WILLIAMS, Reuel, a Senator from Maine; born in Hallowell, Maine, June 2, 1783; attended Hallowell Academy; studied law; admitted to the bar in 1804 and commenced practice in Augusta, Maine; member, State legislature 1812-1829, 1832, 1848; commissioner of public buildings in 1831; presidential elector on the Democratic ticket in 1836; elected February 22, 1837, as a Democrat to the United States Senate to fill the vacancy caused by the resignation of Ether Shepley, reelected, and served from March 4, 1837, to February 15, 1843, when he resigned; chairman, Committee on Naval Affairs (Twenty-sixth Congress); manager of a railroad for twelve years; died in Augusta, Maine, on July 25, 1862; interment in the family cemetery on the banks of the Kennebec River, Augusta, Maine. Dictionary of American Biography; Poor, John A. Memoir of the Hon. Reuel Williams, Prepared for the Maine Historical Society. Cambridge: Privately printed, 1864.